Celtic and Gaelic music aren't usually associated with the guitar (which is, after all, a Spanish instrument). But even many of the most traditional of bands in Ireland and Scotland today include a guitar player, and the guitar lends itself nicely to Celtic music  which, after all, has a rich history with the stringed harp. For the past 10 years, San Diego's Christopher Dean  a veteran folk and bluegrass guitarist  has been exploring his own Gaelic heritage through music. 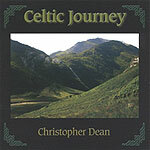 His latest CD, "Celtic Journey," is the third to focus on Celtic music. What's interesting and different about Dean's approach is the fact that he still uses a fingerstyle bluegrass technique in playing Celtic music. The song selection on the new album is fairly standard Celtic fare: traditional jigs and reels, "Scarborough Fair," "Loch Lomond," and one contribution from Dougie MacLean. Dean makes each song accessible and bright  and with his playing the marvel that it is, there's not a dull or boring track here.